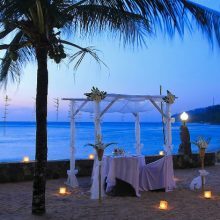 Hotel Tugu Lombok is located on the pristine, miles and miles of virgin white sand beach of Sire, on the northwest coast of Lombok island, surrounded by stunning virgin landscapes and traditional thatched roofed. Carrying the Tugu signature in its mission, style and atmosphere, Hotel Tugu Lombok stands as a monument for the forgotten history, art and romance of ancient kingdoms, where at the same time provides heavenly tropical luxuries like no other resorts do. In 1894, a priceless volume of an ancient manuscript was found at the Puri Cakranegara in Lombok by a Dutch historian by the name of Brandes. Soon enough, this manuscript was identified as the only surviving and most important record of the ancient Hindu era of Majapahit, a vast kingdom that was the most prosperous of all times and reigned through most of the archipelago. The manuscript, known as the Negara Krtagama, has recorded years of history telling from mouth to mouth; hundreds-years-old archeological findings; discoveries among villages in Lombok which were sequentially Buddhist, Hindu, and Bayanist among a predominantly Moslem community around the island and the Chinese Peranakan community in the town of Ampenan. Within a period of 35 years following that, there had been discoveries among the minor communities that had been deemed ‘unimportant’, although actually showed a strong cultural pluralism in Lombok in the past. In bringing back to life these ancient Hindu times in Lombok before the occupation of the Dutch and the Balinese, Hotel Tugu Lombok surrounds itself with chapters from the romantic epic of the Mahabharata. The hotel features hundreds of original, beautiful artworks and antiques painstakingly collected and assembled as a loving testament to the long forgotten, original culture of the isle of Lombok. 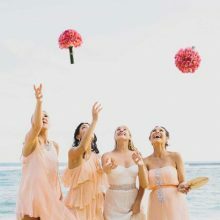 One of best wedding venue in Lombok, Tugu Hotel Lombok is a perfect place for your Love celebration with family and friends and most romantic honeymoon destination in Lombok. • Price is subject to change without notice. Confirmation of price will be given on each quote.